On October 19th 2016, Berlin Global had the pleasure of meeting and interviewing Mrs. Bianca Monroy, a contemporary Mexican artist involved in several projects in Berlin and throughout Europe. The interview allowed us to gain an in-depth understanding of the cultural relations between Mexico and Germany, which are gaining considerable momentum in the framework of the Mexico-Germany Dual Year 2016-2017. Mrs. Monroy shared her vision of cultural diplomacy with us. The interview began with an overview of Bianca Monroy’s career and a discussion of her ability to establish her art in Germany. Bianca Monroy is a contemporary Mexican visual artist who has been living in Germany since 2007. In 2012, she began exposing her art works in Berlin and soon began to conquer the European art scene. Among her positions, Bianca is a member of the Italian artistic movement ‘Spirale di Luce’, together with four other internationally renowned artists. She is the cofounder of the EXATEC Art Club, an international artistic group, as well as the fine arts incubator ‘Brunereau & Monroy’. On top of this, she is the Creative Industries Representative for the Mexican Talent Association in Germany (RTM Alemania). According to the artist, the biggest challenge she has had to face has been proposing a kind of art which does not respect German cultural standards. However, she has managed to use this diversity to her advantage, becoming one of the most recognised mediators between the Mexican and German cultures. Bianca said, “I have been living here for 9 years, meaning my art is not only Mexican art but a fusion deriving from my experience as a Mexican living in Germany”. “I think collaboration is the future of art”, Bianca affirmed, while telling us more about her previous collaborations. Mrs. Monroy has had many opportunities to promote her art by herself, but she has always used these opportunities to bring other artists together. During this Dual Year, she has promoted several exhibitions. One of them will take place in Myer’s Hotel and will last until the end of November, displaying work by 70 German and Mexican artists. On November 3rd, another exposition celebrating the Mexican ‘Dia de los Muertos’ will allow twelve Mexican artists to exhibit their artworks alongside Bianca’s. The exposition is organized by Liz Soto Rivas in collaboration with the Red Talenots Mexicanos Capitulo Alemania. “Mexico thinks that we are talented and highly qualified” said Bianca, speaking about the ‘Red de Talentos Mexicanos Capitulo Alemania’. RTM Alemania is a global network managed by the Institute for Mexicans Abroad, a decentralized agency of the Mexican government's Ministry of Foreign Affairs, which is responsible for supporting Mexicans who live and work abroad. The creative sector was only introduced a few years ago and at the end of last year, Bianca became its coordinator. Mrs. Monroy explained that the main goal of the organisation is to connect German-based Mexican talents to create a bilateral project and strengthen the creative industry. 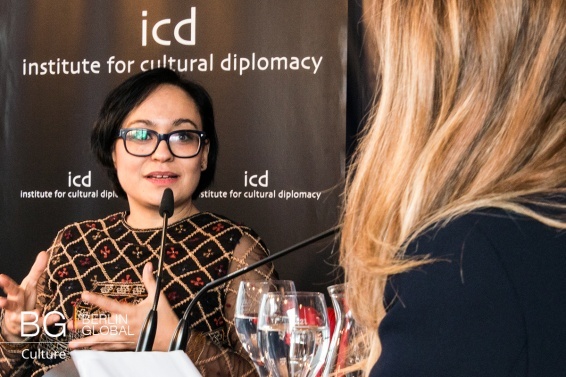 “Every time I introduce myself, I represent my country and wherever I go, I am a Mexican” said Bianca, sharing her personal vision of cultural diplomacy and how this serves as a stepping stone when promoting Mexican culture in Berlin. “I believe that culture represents the future of the world; culture and art are powerful instruments and remaining yourself is an efficient way to transmit culture”. According to Bianca, the Dual Year represents a significant example of cultural diplomacy, as both Germany and Mexico have planned hundreds of activities in all the major fields of interest, including culture, science, and economy, aiming to strengthen their cultural bond. Her hope is for this exceptional occurrence to enable Mexican people to get closer to the German culture. “Berlin is a great place to be yourself. 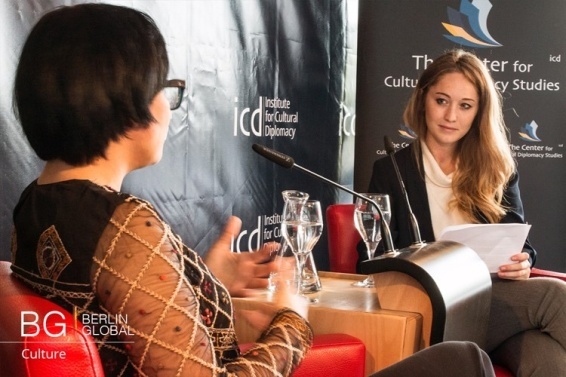 Cultural diplomacy is a huge asset and all the people working in international arenas take it into account”.